"Choose whatever kind of sausage you like--mild or spicy, pork or chicken--for these no knead fluffins." Combine 1-1/2 cups flour, undissolved yeast, sugar, salt and Italian herb seasoning in large mixer bowl. Add water and oil; beat 2 minutes on medium speed. Gradually add remaining 1-1/4 cups flour to make a stiff yet sticky dough. Stir in sausage and cheese. Cover bowl and let rest 10 minutes. 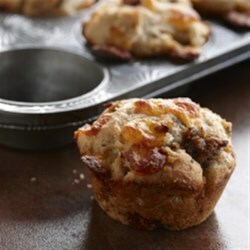 Portion dough into 12 (2-1/2 inch) generously greased muffin cups OR 36 mini muffin cups using a scoop or two spoons (do not use paper liners). Cover and let rise 35 to 45 minutes. Dough will rise, but not double in size. Bake in preheated 375 degrees F oven for 20 to 25 minutes (17 to 20 minutes for minis) until well browned. Let cool on wire rack for 2 minutes. Run a knife around each roll to remove from pan. Serve warm with pizza sauce for dipping, if desired. Refrigerate any leftovers. * Or substitute 1 cup whole wheat flour for 1 cup all-purpose. Very good and I will make again using a different sausage. Like the spicy pork sausage!